Ratko Buzina - Seven Countries Study | The first study to relate diet with cardiovascular disease. Ratko Buzina (1920-2011) caused the former Yugoslavia to be included in the Seven Countries Study. He had found remarkable differences in dietary fat intake and serum cholesterol levels between the coastal area of Dalmatia and the eastern plains of Slavonia in Croatia. Buzina got his M.D. at the University of Zagreb in 1944, and went on to become associate professor there by the time the Seven Countries Study began. In the meantime he visited Minneapolis as a research fellow, and also spent time in India as a nutritional advisor to the WHO. 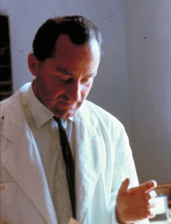 It was during his time in Minneapolis that he and Ancel Keys formulated a plan to include Croatia in the Seven Countries Study. Skilled and productive as a researcher, Buzina has effectively collaborated over the years. Through his contacts with Professors Arpad Hahn and Ivan Mohacek in the Medical Clinic in Zagreb, he was able to mount a competent team for the inauguration of the Seven Countries Study surveys in Dalmatia and Slavonia in the fall of 1958. There he supervised one of the more complex field operations, even in the face of great difficulties. He repeated the surveys after 5 and 10 years and completed the 25-year mortality follow-up. Buzina was President of the International Union of Nutritional Sciences (1981-1985) and long-term Nutritional Consultant of the WHO Headquarters in Geneva.